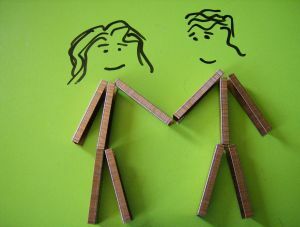 I don’t remember when I became keenly aware of the fact that boys and girls are different. Perhaps it was that time in elementary school when Dominic kept bouncing his feet on the back of my chair…or when Justin told me I couldn’t play Tetherball with the rest of the “boys.” My son is only four, yet the male/female dynamic has begun. A couple of weeks ago, we attended a birthday party for one of the boys in my son’s preschool. As I was enjoying casual conversation with one of the other moms, she mentioned that her daughter talks about my son quite often. To tell you that I was in shock is an understatement. I had no recollection of ever “liking” a boy at the age of 4. But the confirmation came when said girl approached me at the party to ask when I was leaving. “You should leave when we do” she said with a smile on her face. It has begun. 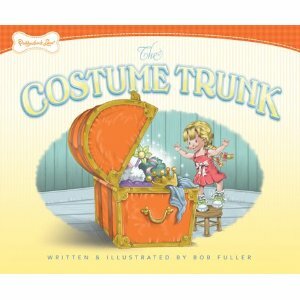 The Costume Trunk, a children’s book authored by Bob Fuller, is all about a child’s imagination. I thought it was adorable how my son’s imagination took flight as we read the story. Tonight we were out at the fair and the unexpected happened. A little girl, who had ridden a previous attraction with my son, decided she wanted to be the driver in my son’s bumper car. I watched it happen…she was in her little red car but uncommitted. She kept looking at my son’s green car. Just as the attendant was about to secure each child in she ran over and sat herself right next to my son. They laughed the entire time as they bumped into other cars while my husband looked at me and told me that we were in for a long road of this (I, of course, already knew this). No compensation was received for this post, which was inspired by the children’s book The Costume Trunk. I received a copy of the book as part of my involvement with From Left To Write. You can read reactions to the book on the site. Assigning real people to the characters in this book seems to be a common theme among the young readers of this book. It happened in the group setting when I read it aloud, too.